We aim to update you about our work with clarity and integrity. We seek to produce news and educational resources that are simple, informative, and encourage you to take action. On our regularly updated Facebook and Twitter pages we connect relevant news stories to areas of our work, helping to explain what we do and why. 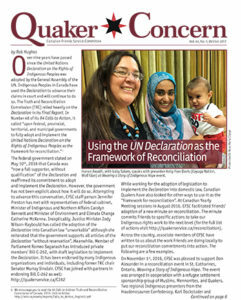 Quaker Concern is an 8-page print and digital newsletter put out three times a year. It shares stories and calls to action from our work. Quaker Concern has its own website. Read it online at http://quakerconcern.ca, download PDF copies, or become a donor to CFSC to receive a free print copy. 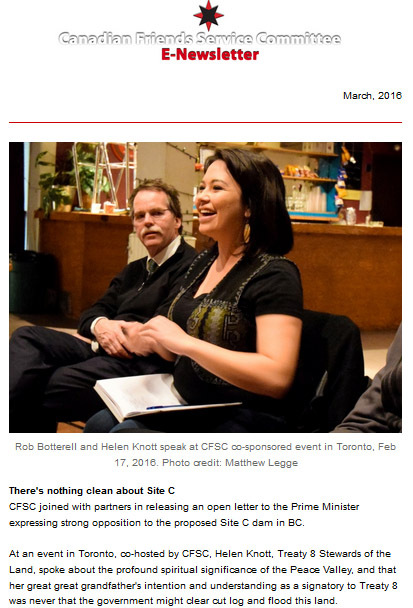 The monthly CFSC E-Newsletter shares current and emerging concerns, updates on our work, our partners’ work, and other news relevant to Quakers in Canada. Canadian Quaker Meetings are welcome to submit items for inclusion in the E-news. Enter your email and click the sign-up button in the sidebar on any page on this site and you’ll receive our monthly E-News. CFSC respects your privacy and will only use your email address to send you the emails you sign up for. You are free to unsubscribe at any time using the link available in any email from us. Note – the issues of the E-News linked to below are in PDF. You may need to right or command click the links and download the files if they are not displaying properly in your browser. For a complete list of updates about our work from most to least recent, see our blog.